Note: due to some recent changes in YouTube APIs, many of the TubeKit's processes may not function. We are working hard to fix this issue. TubeKit is a toolkit for creating YouTube crawlers. 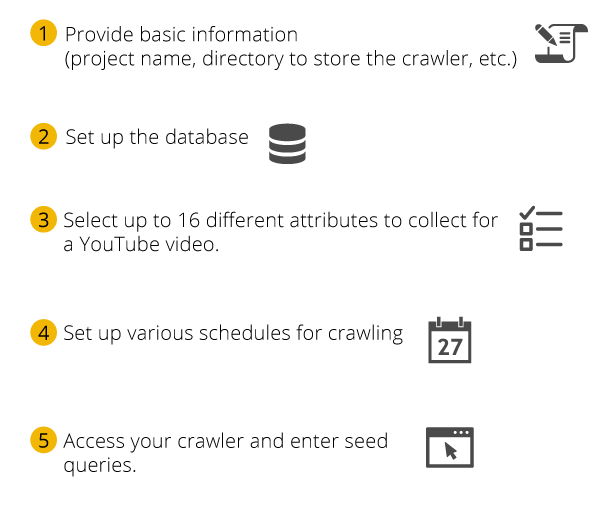 It allows one to build one's own crawler that can crawl YouTube based on a set of seed queries and collect up to 16 different attributes. TubeKit assists in all the phases of this process starting database creation to finally giving access to the collected data with browsing and searching interfaces. In addition to creating crawlers, TubeKit also provides several tools to collect a variety of data from YouTube, including video details and user profiles. Create a Youtube Crawler in 5 EASY STEPS! We have also developed a Firefox toolbar for TubeKit, which lets one accomplish YouTube data collection with just a click! TubeKit by Chirag Shah is licensed under a Creative Commons Attribution-Noncommercial-Share Alike 3.0 United States License.